Knee injuries are among the most common injuries in sports and exercise. Fortunately, among the patients I see in the office, most knee injuries do not require surgery. If you suffer a knee injury, what are the signs your knee injury is serious? Is it worth seeing an orthopaedic surgeon? This list is far from comprehensive, but here are seven signs you have a serious knee injury that might require surgery. It might not be a big deal for your knee to have a small amount of fluid present. On the other hand, if your knee swells up like a basketball in the first few hours after an injury, you could have an ACL tear or fracture. I don’t mean a small pop like the one you feel when you crack your knuckles. I’m also not talking about the popping many of you feel under your kneecaps normally with knee motion. If you hear or feel a loud, painful pop during an awkward landing or when you get hit in the knee, you could have torn a ligament. Many athletes say that their teammates heard the pop when they tore their ACLs. Extreme pain trying to walk is somewhat of a generic complaint. Many injuries can be serious enough to cause pain when you try to put pressure on the injured leg. It is still a sign you might consider seeking medical attention. Your knee buckled or gave way. If your knee buckled when you landed from a jump or changed direction suddenly, you could have suffered ligament damage, such as an ACL tear. 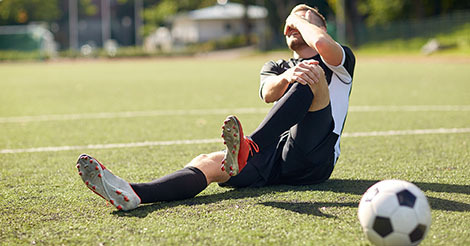 Alternatively, if you experience your knee giving out with twisting or landing movements in sports weeks or months after an injury, you should consider seeing a sports medicine doctor. True knee instability with activities can risk further damage to the meniscus or articular cartilage. Younger athletes can often tear the meniscus in such away that the inner, torn fragment can flip into the center of the knee and block motion. These bucket-handle meniscus tears often require surgery. The surgeon must push the meniscus back into place and repair it with sutures or anchors. Milder or more chronic forms of knee locking or catching also can suggest you have a meniscus tear. You cannot fully extend the knee. Pain, swelling, and inflammation after acute injuries can all make knee range of motion difficult. If a patient comes to my office days after an injury and I can’t straighten the knee, I get at least a little concerned. It can be a nonspecific finding, though. Regardless, I have often found ACL tears, acute meniscus tears, patellar dislocations, and more in these circumstances. Your knee hurts in a very specific location. Patients with meniscus tears usually complain of pain in a very specific spot along the joint line rather than throughout the knee. Medial meniscus tears often hurt along the medial (inside) and posterior (back) side of the knee. Lateral meniscus tears often cause pain along the lateral (outside) and posterior aspect of the knee. Likewise, stress fractures usually cause localized pain on the bone at the site of the fracture. I hope that this list of signs your knee injury is serious is helpful. Again, it is not comprehensive and not intended to replace the advice of your doctor. If anything, I hope you would consider seeing your doctor sooner after a serious knee injury if you have any of these complaints.